been providing strategic oversight of Camp Awosting’s program since he took over as President of Ebner Camps in 2006, after his father, Buzz, retired. 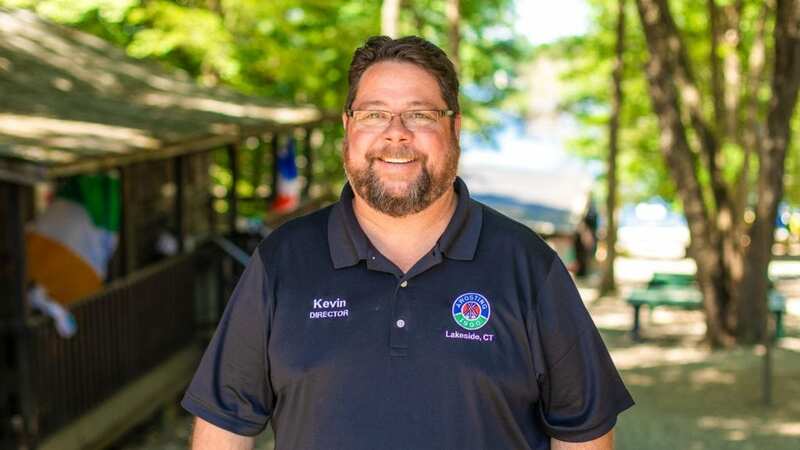 Under Kevin’s leadership, Awosting and Chinqueka have undergone significant renovations to many of their facilities, including improved dining halls, updated cabins and additional adventure courses (High Ropes, Low Ropes). Kevin’s wife, Liz, is also very involved in the camp operation, running the food service for Boulder Ridge Day Camp and the wedding/outing facility run on the same property, The Village at Boulder Ridge. Their son, K.J., also attended Awosting as a child and went on to become staff at Boulder Ridge Day Camp, where he currently is the C.I.T. Director. Their daughter, Kylee, is a camper at Camp Chinqueka. Kevin’s interests outside camp include golf, cooking, spending quality time with his family and taking care of his dog, a 150lb Leonberger named Goose. Alex is the Assistant Director of Camp Awosting. He joined Ebner Camps in 2010, spending 2 years as Martial Arts, Canoeing and Swimming counselor at Boulder Ridge Day Camp. He joined Awosting’s leadership team in 2012 and has since been Assistant Waterfront Director and Head Counselor, prior to assuming the role of Assistant Director in 2017. Alex’s previously worked for Camp America, one of our international counselor recruiting partners. This has given Alex a wealth of knowledge in child protection training and recruiting the best staff from all over the world. Alex’s graduated with Honors from Leeds Business School in England with a Bachelor’s Degree in International Business. He also spent years as a junior instructor for Taekwondo and was a leader for the local Boy Scout troop in England. In 2013, Alex completed the prestigious Duke of Edinburgh Gold Award, a challenge that combines components of community service and volunteering projects. 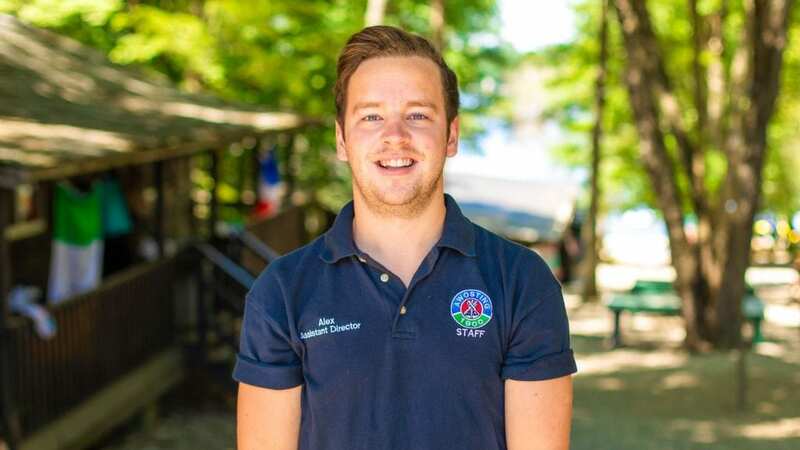 During the summer, Alex is seen all around camp, keeping his ‘ear to the ground’ and ensuring he is aware of everything happening at Awosting. He develops a close relationship with Awosting’s parents and campers, knowing each and every camper by name. During the off-season Alex attends select camper fairs around the world. He also makes frequent home visits to prospective new Awosting and Chinqueka families. If you are interested in speaking with him about camp for this summer or future summers, please email him directly. 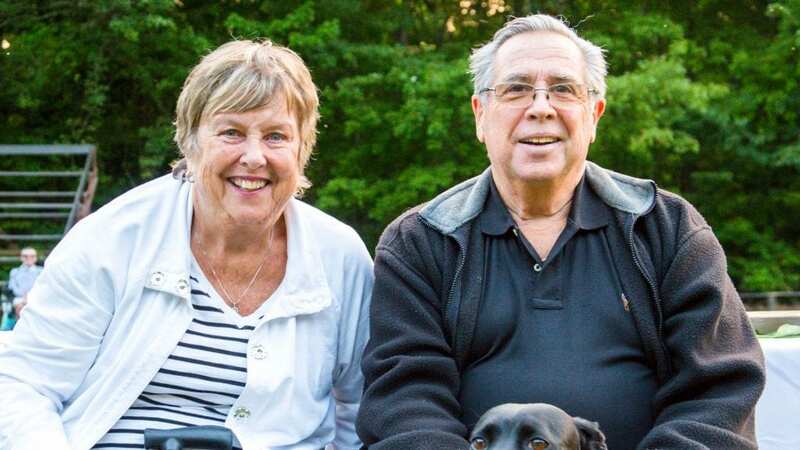 Buzz and Sherry are Directors Emeritus of Camp Awosting and have been together at Awosting for over 50 years. Buzz has actually been at Awosting for over 70 years, having started as a camper at age 6 and been on the staff since he was 16, including nearly 30 years as Director starting in 1975. For many years, they were the “engine” that made Awosting run – combining caring and fun to make sure each camper was treated like one of their own children – and still love being a part of the Awosting community today. Buzz and Sherry have been recognized by the American Camp Association as “Pioneers of Camping” for over 30 years of professional camp experience. Buzz and Sherry’s son, Kevin, is the current President of Ebner Camps and Director of Awosting. He is ensuring that the next generation of Awosting and Chinqueka campers enjoy everything that has made our camps a summer tradition since 1900.